Carnegie Hall's architect, William Burnet Tuthill, designed the main auditorium to have the finest acoustics possible. The entire ceiling is divided into four sections rather than one continuous cavernous vault. Each section plays an important role as sounds emanate from the stage and are dispersed and aurally reflected inside the theater. This main portion of the ceiling-which is 83 feet from the Parquet floor-acts, in part, as a sound reflector to the upper floors, with intentionally sparse detail to help achieve an even balance. From the earliest documentation that exists, two rings of lights were featured; the outer circle has 32 lamps, and the inner circle has three times as many at 96. The hundreds of discreetly placed open slots allowed for the passage of air as part of a state-of-the-art cooling system. 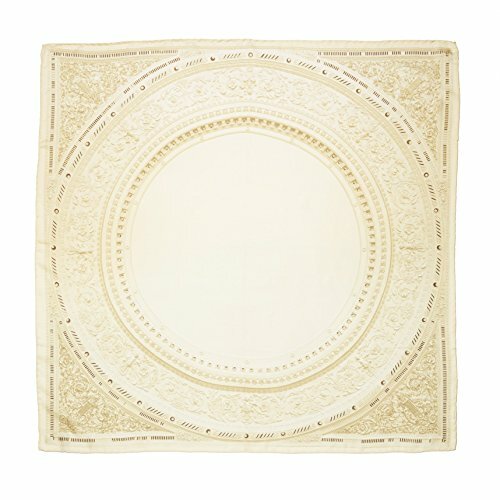 This elegant silk scarf features an image of this intricate ceiling decoration, famously known as the Circle of Lights. If you have any questions about this product by Carnegie Hall, contact us by completing and submitting the form below. If you are looking for a specif part number, please include it with your message.